excellent video…the best I’ve seen on grafting garter stitch and the best explanation of the process…thank you .. Wonderful video! So helpful and clear. Thank you for the tutorials and your wonderful patterns. I am wondering what to do about the jog at the beginning of the seam? How do you keep it from being an obvious jog? Very clear, thank you. Am I right in assuming that the first st was slipped in each swatch? If so, is it better to do that when seaming two garter st pieces? 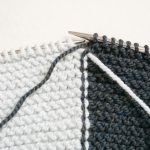 I have heard that when using matress stitch, it is better not to slip the first stitch. Is this right? 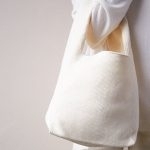 Is it better to slip the 1st st when joining garter stitch pieces in this way? I have heard that one shouldn’t slip the 1st stitch when using matress st, for st st fabric, for example. Excellent question! 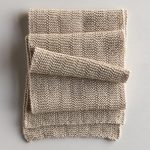 If each panel alternates between stockinette and garter, you may want to try alternating between mattress stitch and the seam technique above. 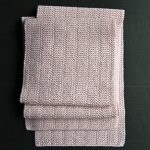 If the stockinette sections meet with the garter sections, I would suggest trying just mattress stitch OR a hybrid of mattress stitch on the stockinette side and garter seam on the garter side. With the hybrid option, use the two techniques to figure out where to pick up your stitch to sew the 2 panels together. I would go ahead and try each and see which looks best!